Bob Woodward said this evening on CNN that a “very senior person” at the White House warned him in an email that he would “regret doing this,” the same day he has continued to slam President Barack Obama over the looming forced cuts known as the sequester.CNN host Wolf Blitzer said that the network invited a White House official to debate Woodward on-air, but the White House declined. 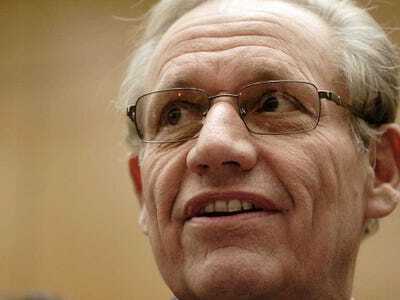 “It makes me very uncomfortable to have the White House telling reporters, ‘You’re going to regret doing something that you believe in,'” Woodward said. The White House aide who Woodward said threatened him was Gene Sperling, the director of the White House Economic Council, BuzzFeed’s Ben Smith reported. The defence Department said in early February that it would not deploy the U.S.S. Harry Truman to the Persian Gulf, citing budget concerns relating to the looming cuts known as the sequester. “Can you imagine Ronald Reagan sitting there and saying, ‘Oh, by the way, I can’t do this because of some budget document? '” Woodward said on MSNBC. Last weekend, Woodward called out Obama for what he said was “moving the goal posts” on the sequester by requesting that revenue be part of a deal to avert it.